Everyone has grown Impatiens, right! It’s one of those ubiquitous bedding annuals even many non-gardeners know that they might put in a pot on their shady porch. I used to grow these by the hundreds when I put together display beds for Parks as they were one of the few freely flowering options available from the bedding plant industry that could ‘produce’ on shade sites. It’s so well known that its common and genus name are the same, a relatively rare occurence in the plant world. As they tend to do, hybridizers pushed the limits on these and, over the years, have developed a good number of cultivars that are tolerant of direct sun, probably increasing their popularity while at the same time teaching an unhelpful message to the general public, that it isn’t really necessary to pay attention to a plant’s requirements…ours are what matters, but that is an entirely different issue than what I want to cover here. It did not take me too long to get bored with the standard palette of annual bedding plants. At home I began experimenting with other less available Impatiens, in particular those forms whose foliage was often brightly colored and patterned…those called ‘New Guinea’ which are also tolerant of morning sun, as long as its not too intense, and they remain moist. I’d plant these out at home, but it didn’t take too long to realize that it was easeir for me to provide what they needed when I grew them in pots as my soil is on the heavy, dense, side, in spite of all the amendments I’ve added. Not long after this we began to periodically vacation in Hawai’i, where Impatiens grew freely. I remember one time driving the motion sickness inducing curves of the road to Hana as it tacked back and forth around the miles of shoreline cliffs with its one-way sections and many narrow bridges and tunnels. Stopping here and there we saw species Impatiens growing on the roadside and cliff faces…well ‘drained’ and moist. This is Impatiens omeiana as it should be…a pretty spectacular filler and blender that can help knit your shade garden together while providing a subtle and elegant touch. This picture is from the eGardenGo site that provides a lot of plant info as well as suggesting plant combinations, design ideas and some ‘how to’ for growing many of the plants in your garden. It is a PNW regionally produced and relevant site and, as such, is a good resource. Check it out! Around 15 years or so ago I discovered for myself Impatiens omeiana, a hardy, (zn 6-9), for us, perennial with beautifully patterned leaves. I found a shady spot near our newly completed bamboo ‘pavillion’ and planted them excited to see them increase….they didn’t. They languished, weakened. In the following Spring, and the next, they died. This is one of those gardener embarassments, that I didn’t used to talk much about. We all have them and it always concerns a plant we’ve seen many others grow well, but for us, inexplicably, dies. I bought it again. It died. I bought it again, added some more amendment. It died. I tried it in another spot. It died. It isn’t just me! I planted it around ten years ago in the 5th St. beds on the west side of City Hall. It grew thickly over a foot tall. I believe it’s still there. So what’s the deal? I know I’m stingy with water…it’s something basic to my character. My home garden is on a manual drip system. I do augment that by watering with a breaker and wand, but maybe not enough. At City Hall it was on an automatic system and I didn’t have time to check it every day, so my schedule was no doubt more generous. The soil at City Hall was highly amended and much better drained. So there are two differences. There is a third and fourth as well. First, my neighbor has a Kwanzan Cherry right on the property line and its roots are thirsty. As thirsty plants are want to do, their roots will grow out towards the water and nutrient they need that may not be so available back ‘home’. I believe this is the case. More importantly, at least when this Impatiens is ‘stressed’, I believe it is more subject to ‘attack’, in this case the enemy is a well entrenched population of root weevil, an insect that my garden came to me with. To this day when I see this grown well in the gardens of others, I am a little bit envious. I’ve even heard people warn others that it can be somewhat ‘thuggish’ in the garden. My embarassment deepens at this point and I hide my shame. When Jimi spoke of ‘Sango’ as one of his chosen in his presentation, he piqued my interest again. I searched for this and found it on line from european nurseries only! One of these states in their description that it appears to be the same clone as I.omeiana ‘Silver Pink’ which is sold in the US, including several Pacific NW growers, like Dancing Oaks, Secret Garden Growers and Cistus Nursery. This cultivar(s) is known for the red/pink undesides of its leaves which shows through the mid-rib on the upper side. There are several other cultivars available in the trade including one made by Dan Hinkley. A look at the ‘Plant Lust’ website lists multiple growers, of the more silvery/white veined species. Plant choice for gardeners is such a personal aesthetic choice, which cultivar you acquire may not matter too much, as they will share very similar requirements for conditions….Those working in the plant conservation world, will be pickier, because each cultivar represents a very narrow portion of a species genetic diversity. The original plant was selected in the wild for those very remarkable characteristics and then propagated to meet the need. These clones are produced asexually, not from seed, and it is important in terms of genetic diversity when doing conservation and restoration work to preserve and work from a much wider slice of the genetic pie. The goals are very different. There was a ‘correction’ made to the western spelling of Emei Shan from the previous Omei Shan. This problem is very common when names are translated from languages like Chinese that use sinograms, characters, rather than using an alphabet. Botanical names, once assigned, aren’t adjusted with such changes. It remains in endangered status at least in part, ironically, due to eco-tourism as people flock to the Mount Emei area, a designated world heritage site. This has been a popular area for plant explorers as well for years because, once again, it has a relatively diverse and unique flora, that like so many other such sites around the world, lies at the convergence of several different biomes. Mountains like Emei Shan often have a unique flora for a related reason as well, the fact that they are mountains that exist surrounded by much warmer lowlands that have isolated them for thousands of years. These areas are much like the Madrean Sky Islands of the American Southwest which, surrounded by low desert, Sonoran or Chiricahuan, have unique flora that are unable to mix genetically with one another. These places are especially vulnerable to climate change because as temperatures warm plants are ‘forced’ up to shrinking areas which may be unable to support healthy populations. Among other plants Epimedium have been collected there, some species having ranges that are restricted to very small areas on that mountain alone, often on its wetter/sunnier south side, remember this is monsoon country, or on the northern drier side. The flora can be very different. Okay, now be honest, who wouldn’t want this plant? You may be thinking that its all well and good to want such a plant, but if it is from Vietnam, as its specific name implies, we can’t possibly grow it here…To which I respond, ‘Are you sure about that?’ Vietnam is more than rice paddies and jungles. Mountains lie to the north, heaving up, posing a formidible barrier with the mountains of southern China. This is one of the areas PNW plant explorers like Dan Hinkley and Kelley Dodson and Sue Millikan, of Far Reaches Farm, trek in search of rare, beautiful and adaptable gems for our gardens. 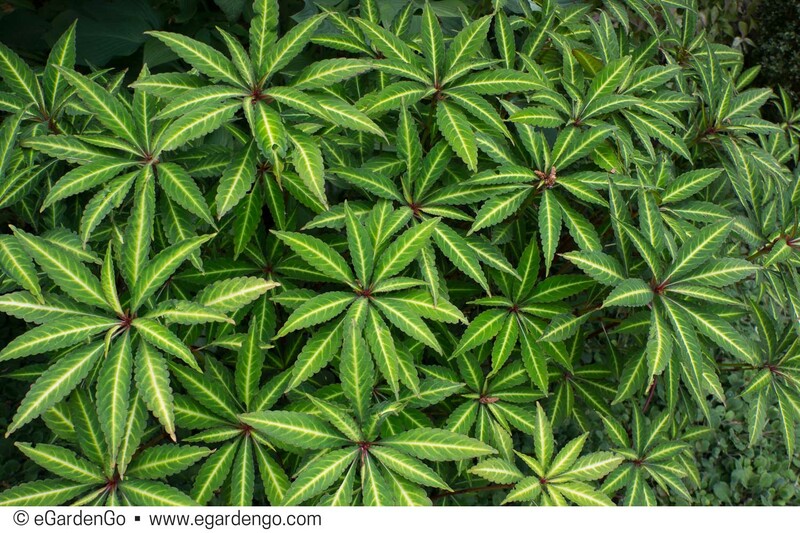 From this region they’ve brought various Schefflera spp., combing the mountains for hardy trees, shrubs, vines and herbaceous perennials, including Begonia and Polygonatum spp. 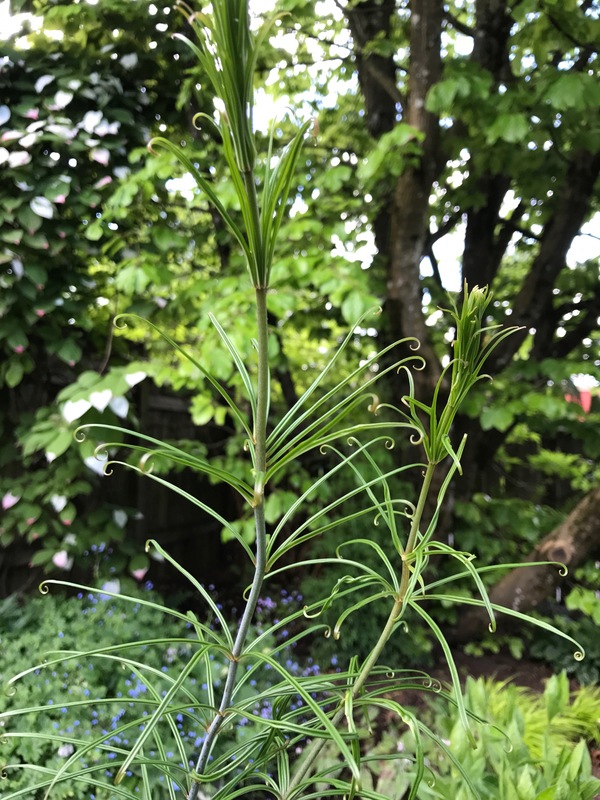 While the latitude there is sub-tropical, the elevation gives a portion of these species enough hardiness to grow here in the PNW, in some cases without any additional protection beyond a good site. The view toward Fan Si Pan from Sa Pa, rising over 5,000′ higher in the distance. The mountain town here receives just over 100″ of rain annually, the bulk of it during the monsoonal summers, but still accumulating a significant share during winter. Sa Pa is a town at around 5,000’ in the mountains of far northwestern Vietnam, where the Himalayas reach their southeastern terminus. Fan Si Pan, nearby, at 10,311’, is the last significant peak in the chain and Vietnam’s tallest mountain. Although the town lies at about 22ºN latitude, the climate is moderate and rainy in summer (May—August), and foggy and cold with occasional snowfalls in winter. Temperature ranges put Sa Pa into our USDA growing zone 9a or 9b and likely colder in the taller mountains. (Interestingly, I read of a bamboo that grows by itself in the thin mineral soils, above timberline, atop some of these mountains.) Overall, the terrain is rugged and mountainous. The conditions combine to make this the home of many rare and endemic species, both plant and animal. Sa Pa’s geographic position, is at the convergence of several of the world’s “biomes” (distinct biographic areas, think tundra, desert, savannah, etc. ), producing an assemblage of plant and animal species unique in the world. Polygonatum vietnamensis looks very much like my P. kingianum (Whoops! Apparently this has been renamed P. huanum since I acquired it!) that I got a couple years ago from Far Reaches, in both its structure and stature. P. kingianum, can be found in forests, thickets, shaded moist grassy slopes and rocks; between 700–3600 m. in the Chinese provinces of Guangxi, Guizhou, Sichuan and Yunnan as well as in Myanmar, Thailand and Vietnam. See this key of the genus of species in the Chinese Flora. Both are quite different than the ‘normal’ Solomon’s Seal’ most of us are used to growing and seeing. P. kingianum holds its leaves in a very similar fine textured whorl, each leaf, rather remarkably, tapers to a very narrow tip and seems ready to cling to whatever they can to help support the otherwise tall, narrow and ‘spindly’ looking plant. Both will bulk up as the rhizome grows producing more and taller stems. Idealy, I suppose, these would grow up through an open growing woody understory for additional support. If you choose to do this I would suggest a shrub the has a very open structure so as not to obscure this, also, make sure the accompanying root system isn’t overly aggressive. Remember that 100″ of rain, these will want to have a moist root zone during their summer growing season a situation that is already difficult in our mediterranean dry summer climate. My P. kingianum, standing rather exposed, tends to flop over. It doesn’t break, just continues growing more horizontally. Provide a frame if a plant neighbor is not up to the task, just make sure it isn’t too ‘conspicuous or ugly’. My selection from Far Reaches is said to potentially reach 12’!!! 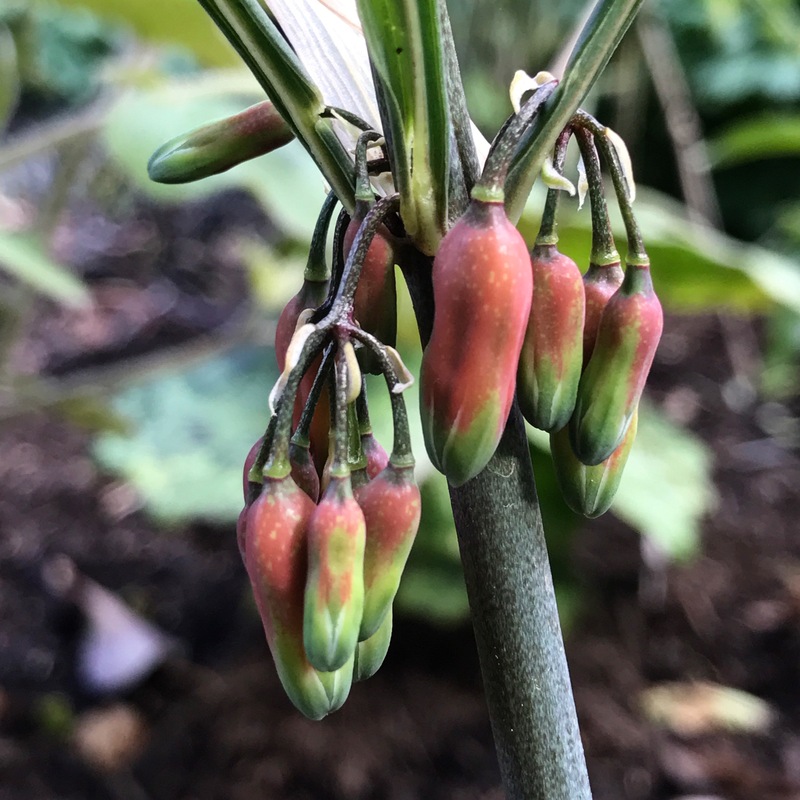 This is my Polygonatum kingianum shortly after it emerged in Spring, replete with tightly held flower buds their thin, lanceolate angular leaves all akimbo. Some time after flowering my P. kingianum with its leaves reaching out and curling, vainly trying to grab on to support. The early flowers on my P. kingianum their corolla’s still held tightly closed. Now, after having said all of this, could these be different forms of the same species? One site says P. vietnamicum is not yet recognized, but it likely is a separate species. Another says P. kingianum is likely two or more species. There are significant, to them, differences in flower structure. I don’t know, but here is a link to a photo, on Flicker,taken in the Spring of ’17, of a red flowered form of P. kingianum from Green Mile Nursery in Belgium. As is generally the case, the flowers don’t care what we call them as long as we treat them respectfully and appropriately! There are other closely related species including P. cirrhifolium, that grows in parts of Yunnan, Sichuan, Nepal and Sikkim, and the arctic, alpine and montane species, P. verticillatum which is found on appropriate sites in Europe and the Himalayas. Oddly, there is little to no occurrence between these two widespread regions of P. verticillatum. The latter species has been assigned ‘threatened’ status on the IUCN’s Red List in Scotland. This is a quite common occurrence, when a species may have always been has become ‘locally’ threatened even though in another region it may be unthreatened. There was a survey undertaken in Scotland to better understand its vulnerability there discussed here. Keeping It Green Nursery, in the PNW, has this in their inventory. It can also be found in a ‘red’ flowered form. Here’s a link to an iNaturalist page on P. verticillatum. Participants in this informal survey have been European as no sites are noted in China. Still its interesting to see. One last note here for those handful or more of you still trying to keep up with the often confusing taxonomic changes, that yes, concern this genus as well. Polygonatum has been placed in the Asparagaceae for now, a large family, that was previously included in the even larger Liliaceae. The good news is that the now much smaller Liliaceae, which has been re-circumscribed, that means defined, from some 300 different genera and 4,500 species, down currently to a much more manageable 15 genera and 600 species. Unfortunately this leaves Polygonatum in with the 7 sub-families, 114 genera and around 2,900 species in the still unwieldy Asparagaceae, which will probably still see more changes. To make this more ‘graphic’ consider that the genus Agave is also a member as are Yucca, Cordyline, Camassia, Dracena and Hosta??? Why would anyone like me, a gardener who has never wintered a Roscoea successfully in the ground even one year, even think of writing a piece on these plants? especially when many people grow these successfully and there is apparently good information available on line from multiple sources? I have no idea! Possibly because I’m a glutton for public humiliation? Perhaps. Please, let me spin this and maybe you will find something of value here. Roscoea are members of the true ginger family, Zingiberaceae, a family that I have been successful with as a group, growing several Hedychium, Zingiber and Alpina over the years, a few for almost 20. Most members of this family are tropical and sub-tropical. Roscoea and the closely related Cautleya, are temperate. Botanists speculate that these have evolved more recently, over the last 50 million years, as the Himalayas rose up in response to the sub-continent of India ‘crashing’ into Asia. This uplifting was slow enough for these and other plants to adapt to cooling temperatures. Their genetics illustrate this by being so closely allied with their tropical cousins. This map shows the distribution of the genus Roscoea limited primarily to this raised geography near the northern extreme of the tropics. This northern continental ‘drift’ continues in a way imperceptible to the eye, but measurable by instruments. The different colors show the physical grouping of species into related ‘clades’. The western clade has been evolving genetically independent from the eastern. Recall that clades are ‘monophyletic, all members of a clade can be traced back genetically to a single ancestor. The smaller, outlier areas, each correspond to the larger two with the exception of the single species in the black circle which has not had its DNA tested. This area, in the ‘gap’ between the two is thought to be where the genus evolved and have since move ‘out’ into areas with appropriate conditions. 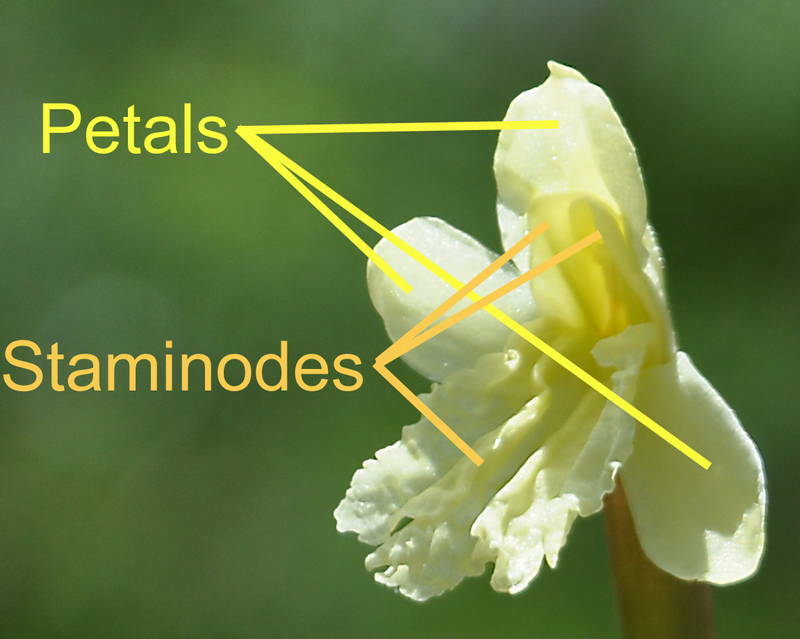 This is typical of Roscoea humeana flowers, which can be found in a range of colors as indicated by Jimi’s two selected cultivars. 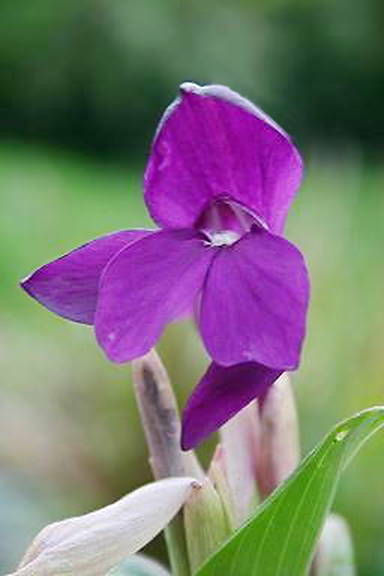 Roscoea humeana, one of 22 species, is one of the more popular species grown by gardeners. it is found in the Sichuan and Yunnan provinces of south central China in the larger area on the map above bound in red. 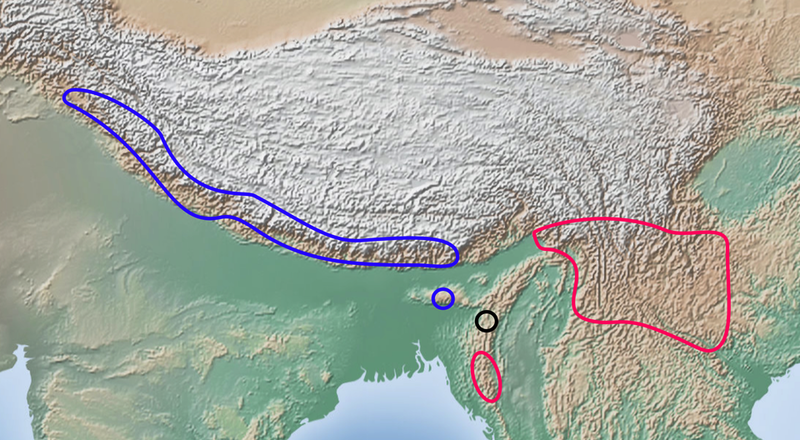 Its range covers roughly a third of the portion toward the left or west, most of which lies directly north of Myanmar. The map above indicates how mountainous this region is. It occurs naturally in a variety of conditions and plant communities from more open Pine forest to scrub, meadows, grassy even open rocky areas, not in heavy shade, preferring some sun. It is often grown as a rock garden plant preferring the good drainage and moist soil during its growing period as well as the sun. A rock garden situation also provides a location to appreciate these rather diminutive Ginger members, which often range from about 5″-12″ tall, rather short for a family whose species are often 3′-6′ tall and more. Other species and hybrids can be as tall as 18″. This would indicate that they might also make good pot specimen and here in the PNW they could be quite hardy in pots through our zn8 winters as generally our coldest periods aren’t long enough for larger pots to fully freeze, something I might try as the Roscoea purpurea, I’ve tried and failed with, were planted out. (I’m not sure why I’ve lost them. Could they have been too small. I have no records to indicate whether their deaths might correspond to our erratically occurring colder winters, but most of these are solid zn6 plants. Or, if they didn’t receive enough sun and went into the winter ‘weak’ or if they were simply out competed by too aggressive of neighbors, certainly a possibility in my garden.) Depending on its situation it will bloom from mid or late Spring to early Summer just after the plant emerges, before its leaves fully extend. The closely related Cautleya genus contains only two species, which are also temperate and located in the same region. Both form a short starchy rhizome below the soil surface with fleshy roots. Neither have a stem with differentiated tissues. They, like other family members, form a pseudo-stem of compact, rolled leaf tissue, a common characteristic of most monocots having individual leaf blades that extend out. The blades are continuous in Roscoea while in Cautleya spp. the blades have a short, narrow, petiole like structure, but it is the same tissue. There are also differences in the flowers and inflorescences, Cautleya having colorful, contrasting bracts forming an enclosing calyx around the petals with each flower carried on a short peduncle giving it a ‘ladder’ like alternating form. Roscoea have longer peduncles that arise off of a short spike down within the leaves giving the plant a very different appearance. Both have complex flowers that some try to liken to Orchids, which are a very distant relative. The species of both genera have a 3-petal structure that is augmented with 3-staminodes, sterile stamen, that have evolved into petal like structures, modified both extravagantly and elegantly. Hedychium is a genus of 70-80 species that overlap into this same area with many others being limited to tropical and sub-tropical areas. Of these I have grown H. coronarium, H. greenii, H. densiflorum, H. gardenerianum and the hybrid ‘Tara’, a plant widely accepted as the most consistent flowerer and performer in the PNW. ‘Tara’ is also the recipient of the Royal Horticultural Society’s Award of Garden Merit. H. greenii tends to be a late performer for me often only starting flower as Fall has taken full hold and, consequently the flowers are neither fully expanded and are short lived. The foliage is less coarse and is quite attractive with its reddish tint. I’ve also just acquired H. wardii var. ‘Gaolingongshan’ as a division from the horticulturist responsible for the richly diversifying ‘Himalayan Cloud Forest’ Garden tucked away in Portland’s Washington Park. He’s another hardy Ginger believer. Ginger’s as a group seem to be somewhat heat dependent. Parts of the world with higher average daily temperatures result in earlier and longer lasting flowering periods, probably a result of their tropical ‘roots’. Our cooler summer nights tend to delay flowering, though this is beginning to be less of an issue as our summers warm. Still, as warm as it has been this summer with our daily averages setting new high records, my ‘Tara’ is just now starting to flower in mid-August. Roscoea, often growing quite high in the Himalayas, experience relatively warm summer nights with high humidity that keeps temps from dropping too low. And, once again, the monsoonal climate of this region supplies them with all of the water they need for quick sustained growth, another issue for us with our dry mediterranean summers. 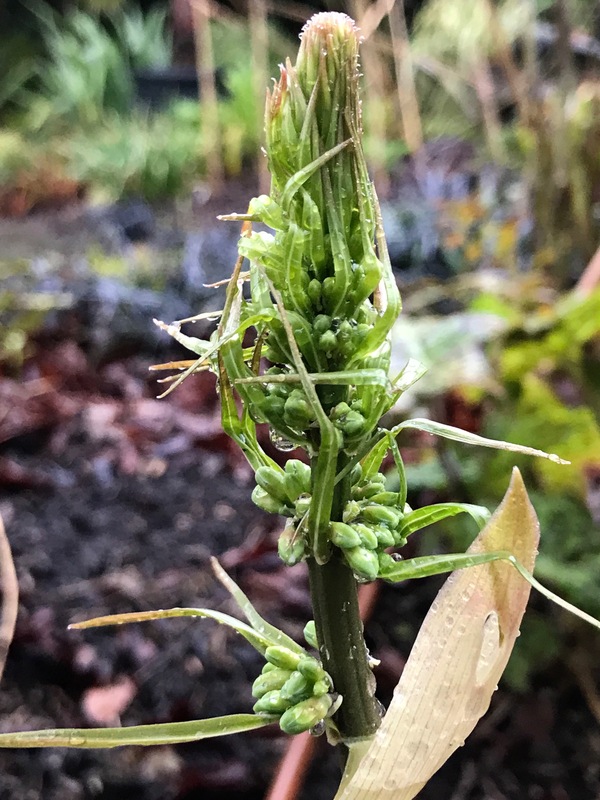 Roscoea are also slow to emerge in the season waiting for temperatures to warm before they break dormancy, allowing their more tender top growth to avoid freezing temperatures. This also delays growth until the rains of monsoon begin. These two characteristics require us to be patient while all of our temperate plants are exploding around us. Many a plant has been lost because, slow to emerge, they’ve been forgotten, maybe tossed away or sliced through with a spade opening them to rot. I have several such ‘late risers’ and I really should mark them better to protect them. Another curiosity and characteristic of these one time tropicals is that their flower structures have retained what botanists generally agree on is a deeper nectary that once attracted long tongued pollinators, none of which appear to live in their now high elevation homes. Instead these are visited by generalists pollinators that are unable to reach the nectary and only feed on the more available pollen. These are also thought to be self-pollinating if no capable insects arrive in a timely manner. As I’ve said elsewhere, part of the problem with lusting after ‘new’ plants is their relative rarity and consequent unavailability. If you go to RHS.org, you’ll find that they provide a way to search nurseries for particular plants…in the UK. Sources do exist, but it may require that you fly their to retrieve them after going through the proper paper work, of course. They show a dozen different sources, seven mail order, for ‘Harvington Raw Silk’ in Wales and England. For Roscoea humeana ‘Snowy Owl’ they show three suppliers, one each in England, Wales and Scotland. There are relatively few pictures of it available as well, but it is a beauty! My German is nein!, but this site does have a nice picture, along with those of a few other varieties. Here’s another one. Roscoea humeana ‘Rosemoor Plum’ will require you to find your way to the two nurseries in Somerset County, in the far southeast of England, which offer it. All three of these only seem available in the UK. Until US nurseries import these we will likely have to ‘settle’ for those available from domestic nurseries…which do afford us some choices. Other Roscoea are available here in the US, while by no means common, from an assortment of smaller/specialty nurseries like Far Reaches Farm, surprise, surprise. 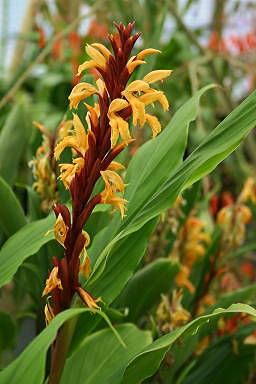 As long as you’re there check out their selection of Cautleya, Hedychium, and Zingiber mioga! Go to the source! When all else fails go to Plant Lust…or perhaps go there first! I see that Edelweiss Perennials has several varieties of Roscoea available. Other regional nurseries periodically list one or two. 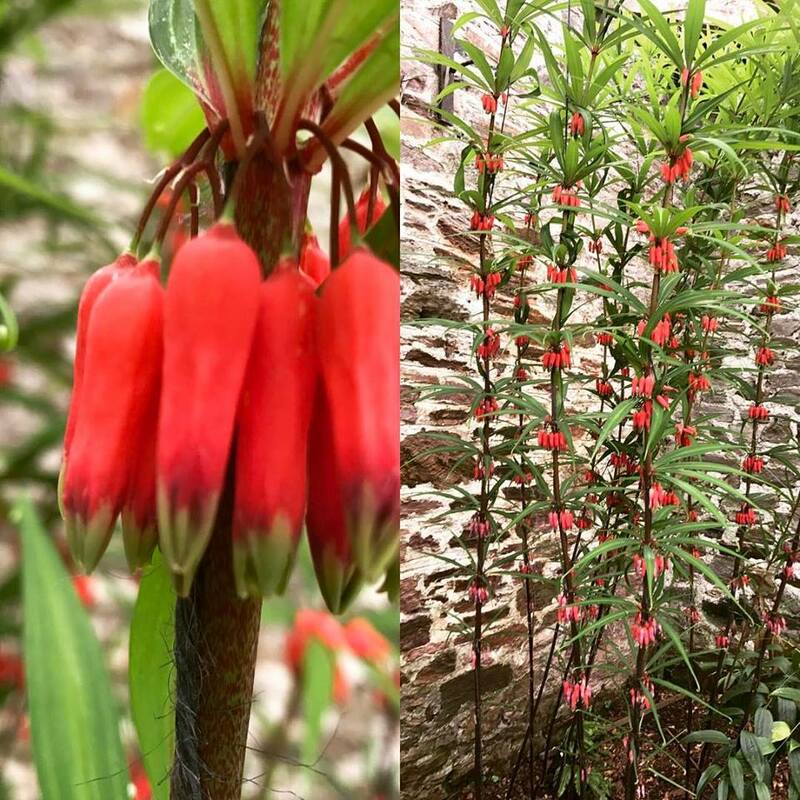 This little combination shot of Brassaiopsis mitis comes from the French JardinJungle.com site…did you notice those thorny stems, very cool. Assuming these are younger plants and their tendency to be slow to branch is common in many woody family members…adding to their rather bizarre appearance. Unlike many other of the Arailaceae grown here this is deciduous. If I had had any idea what this was before I posted my first in this series, it would be with it and the other Araliaceae, but I didn’t, and having seen pictures of this now recognize it as a unique and gorgeous foliage plant with palmate leaves cut even more extremely and bizarrely than the relatively rare Fatsia polycarpa I wrote of in my last post. Click here for a view of several photos of B. mitis, on the Asianflora.com site. There are 45 species in this genus, all of them Asian, concentrated along the same mountainous band much of the rest of the family can be found in, five of which can be viewed on this site. A few are more tropical and can be found down into Indonesia. This one has been found in the mountains of northern India, Nepal and Bhutan and is said to be hardy in zn9a to 20ºF or so. It is not a ‘new’ species to botany as it was first described in mountainous India in 1849. Brassaiopsis mitis grows into a small tree, generally under 20′ tall to 25′ in the wild, with the typical umbel structure of an Araila inflorescence, generally blooming in November-December in their home range. The picture to the right shows its foliage emerging in Spring from its spiked stem. 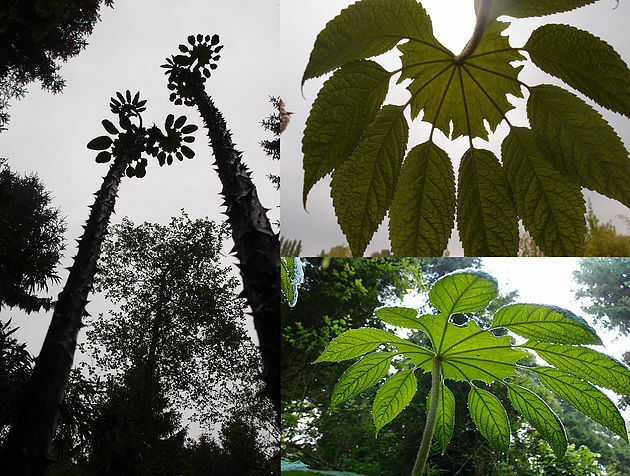 Its leaves are palmate with 7-12 lobes cut deeply to 2/3 of the way to the center where the petiole attaches, the leaf growing to as much as 24″ diameter, each petiole reaching about 24″ in length as well…pretty impressive. 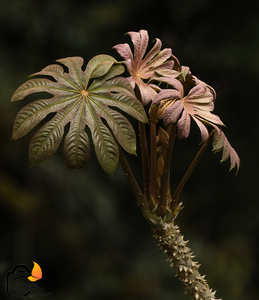 This Aralia grows in broad leafed forests in Bhutan, Sikkim, into India around Darjeeling and Nepal around the 5,000′-8,000′ elevation where they grow quickly in the steeply ascending valleys of the lower Himalayas. Many smaller villages are located in and near this area which pose predictable threats to the native landscape from firewood gathering, grazing and tourism pressures. The trees are often kept low so that their leaves can be cut and fed to livestock. large areas are held in bio-reserves here, but there are many local political problems around gaining community support to protect them so pressure is increasing on these biomes and the many species resident in them. It is difficult to find growing information on this plant in areas outside its natural range. There does seem to be mention of it in some European gardening forums, but not in english. Online forums indicate that there is a reluctance amongst gardeners there to plant this outside in their garden soil as people are worried about their plants survival. However, there is at least one growing outside at the Karlostachys Jungle Garden, Route de Beaumont 76260 EU / Côte d’Albâtre. not far south of the English Channel on the border between Normandy and Picardy. The garden covers 12 hectare and contains the largest collection of Bamboo in Europe in its collection of 5,000 taxa. 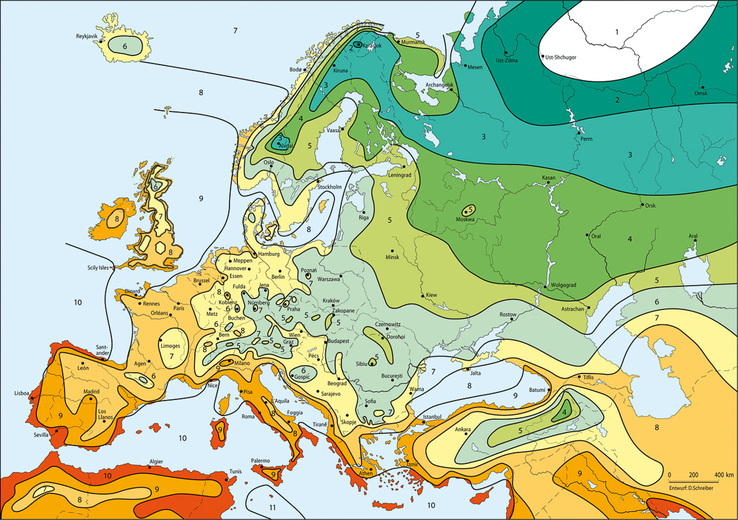 I found a map that applies the standard USDA growing zones to Europe, though it doesn’t refine it down to a and b levels for each zone, and of course it doesn’t recognize warmer and cooler micro-climates. Having said this, this section of Normandy’s Alabaster Coast has a winter average minimum of 37ºF. The Côte d’Albâtre would appear to have a climate very similar to Jimi’s in county Wicklow, USDA zone 9a.